Lawrence Blum is Distinguished Professor of Liberal Arts and Education and Professor of Philosophy at the University of Massachusetts, Boston. His scholarly interests include race studies, moral philosophy, philosophy of education, social and political philosophy, moral psychology, multiculturalism, and philosophy and the Holocaust. 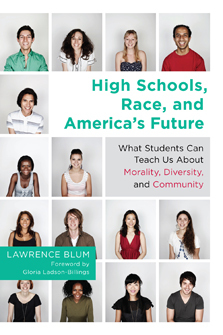 Author of the recently published High Schools, Race, and America's Future: What Students Can Teach Us About Morality, Diversity, and Community, published by Harvard Education Press. The book is based on a course on Race and Racism he taught at his local high school to a racially and ethnically diverse class of seniors. Blum has written five books: High Schools, Race, and America’s Future: What Students Can Teach Us About Morality, Diversity, and Community (Harvard Education Press, 2012); “I’m Not a Racist, But”: The Moral Quandary of Race (Cornell UP, 2002) (which was selected best book of the year in social philosophy, by the North American Society for Social Philosophy); Moral Perception and Particularity (Cambridge UP, 1994); A Truer Liberty: Simone Weil and Marxism (co-author: V.J. Seidler) (Routledge, 1989); Friendship, Altruism, and Morality (Routledge and Kegan Paul, 1980). Professor Blum has also taught at UCLA (in Philosophy), Stanford School of Education, Teachers College, Columbia University, and (in spring 2013), Rhodes University in Grahamstown, South Africa. He has also taught about race and racism in high school (the subject of his most recent book) and works with K-12 teachers on teaching about racial subjects. Blum is married to the historian and film scholar Judith Smith, who teaches in (and was for many years the director of) the American Studies Program at University of Massachusetts, Boston.